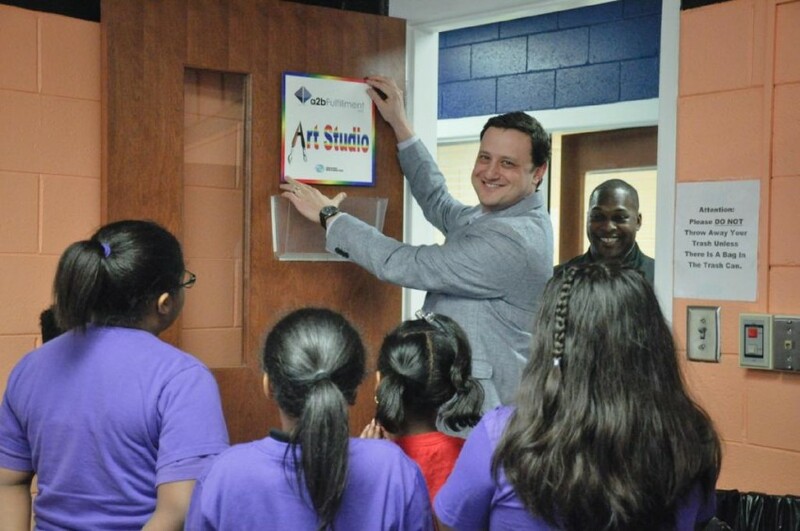 a2b Fulfillment, a third-party provider of business support services, including Warehousing, Order Fulfillment and Customer Care, announces the Grand Opening of the a2b Fulfillment Art Studio in the Pete Nance Boys & Girls Club of Greensboro, GA. The Art Studio is located in the Pete Nance Boys & Girls Club at 1441 Martin Luther King Blvd. in Greensboro. A ribbon–cutting ceremony was held recently marking the official opening of the studio. The Art Studio was donated by Ayal Latz, President and founder of a2b, and his wife Kara. Sarah Latz, a2b’s Director of HR and an artist herself, helped design the space. The room is brightly colored, filled with inspiring student art, and is equipped with easels, double sinks, and adjustable workstations. The studio will provide daily opportunities for young artists to learn and experiment with mixed media. Graphic design and other software programs such as Corel Draw will also be made available to expose students to careers in advertising, fashion design, enhanced photography, and animation. Since 2013, a2b Fulfillment has served as a corporate sponsor of the Boys & Girls Club.